P5335 Small Acrylic plate with blue border on natural Alder wood plaque. 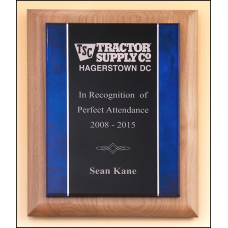 P5336 Medium Acrylic plate with blue border on natural Alder wood plaque. P5337 Large Acrylic plate with blue border on natural Alder wood plaque.